Christy’s loop started from near the Ranger Station and went clockwise. Click to enlarge. 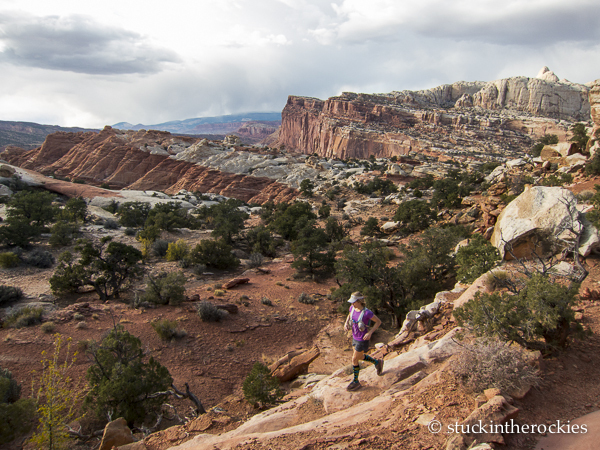 We decided to check out Capitol Reef National Park last weekend. 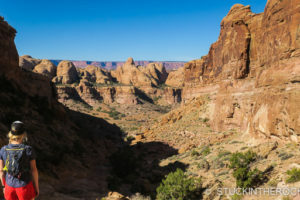 Like many people, we had long known of this National Park in south central Utah but had never spent any actual time there. One of it’s major attractions is the Waterpocket Fold, a 100 mile long exposed monocline— a geologic uplift that has since partially eroded revealing the horizontal strata turned on its side— the longest in the U.S. 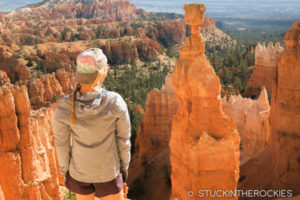 But it’s also home to some really cool canyons, backpacking, and general fall desert fun. After the three mile warmup on Highway 24, we got on the Chimney Rock Trail. 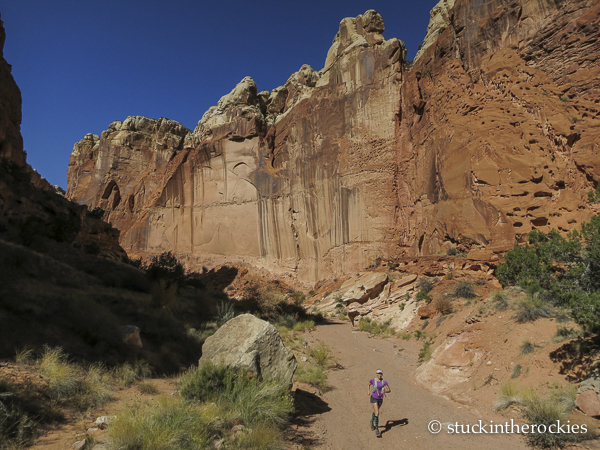 The Chimney Rock Trail leads into Spring Canyon, which we took for about 6-7 miles to Grand Wash.
As far as national parks go, Capitol Reef feels pretty quiet and that’s probably due to the neighborhood which it resides. With nearby NP heavyweights Zion and Bryce to the west, and Arches and Canyonlands to the east, Capitol Reef might get overlooked by the average park tourist. 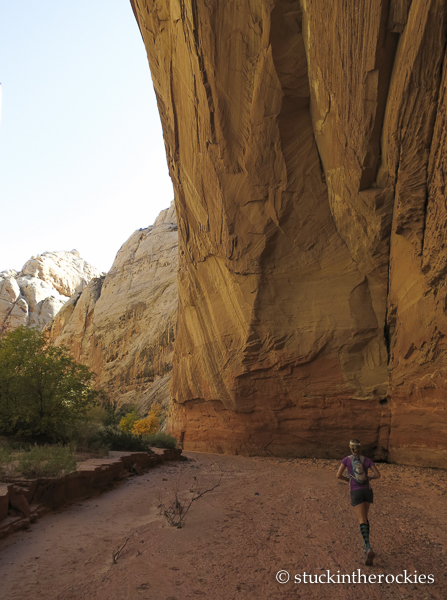 And just southwest of the park is the uber-wild Escalante Wilderness, a bucket-list destination for the slot canyon adventurer. 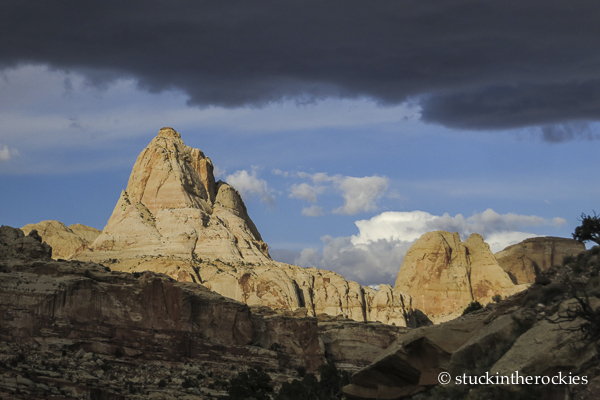 I’ve twice driven Highway 24 to Escalante right through Capitol Reef without even slowing down. Yet despite its flyover state-like status, there’s a lot there, except of course other people. It was time to pay a visit to this somewhat under appreciated bit of Utah canyon country. The desert in autumn can be the best time to visit. 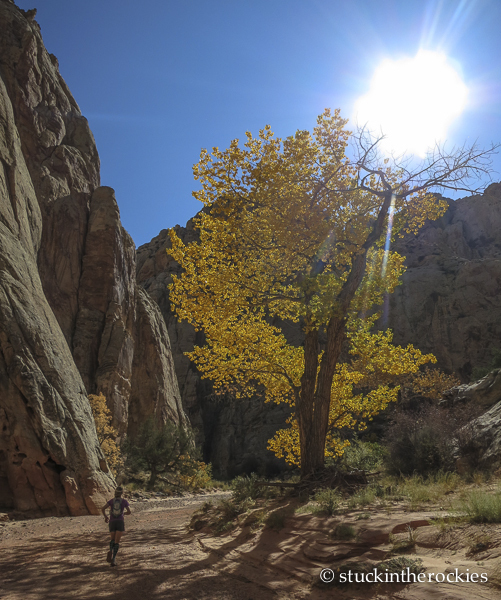 Cool temps, the canyons are dry, and in this case the cottonwoods were all changing. Spring Canyon empties into the Fremont River, which we had to ford (about thigh deep). We left a cache of water and some food by the highway, before venturing in to the back end of the run. As you might have guessed, our first outing in the park was a long run. 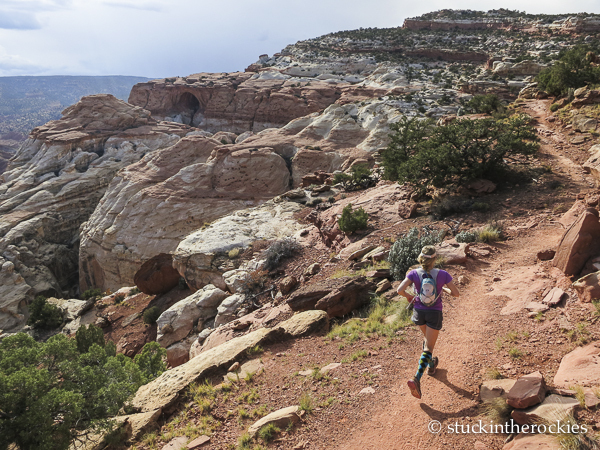 Christy took the map and came up with the plan, a 20+ mile trailrunning loop from the Fruita area. 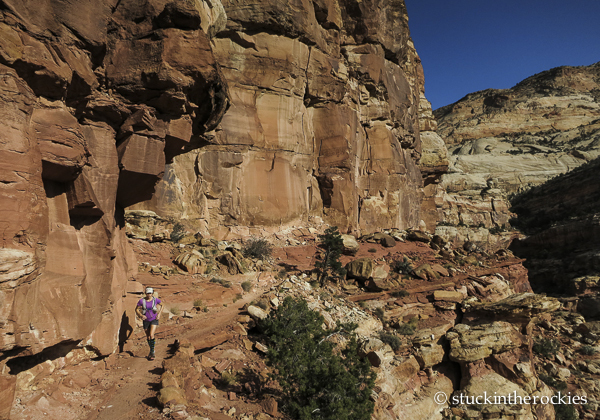 It was an awesome intro to the central area of Capitol Reef. 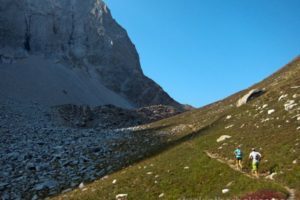 Spring Canyon is considered a “primitive trail” Every so often we found ourselves in unsorted river stones, but for the most part, it was runnable. Once in Grand Wash, we followed a cool trail up towards Cassidy Arch, named for Butch Cassidy who was known to hideout in these parts. From the Ranger Station, either organize a bike/car shuttle or just run the 3 miles to the Chimney Rock Trailhead. With that behind you, follow a well signed route up towards Chimney Rock and to Spring Canyon. Take the dry canyon all the way to the Fremont River, ford the river, and head a few hundred yards down the road (east) to the Grand Wash Trailhead. It may be good to leave a food/water cache here in advance. 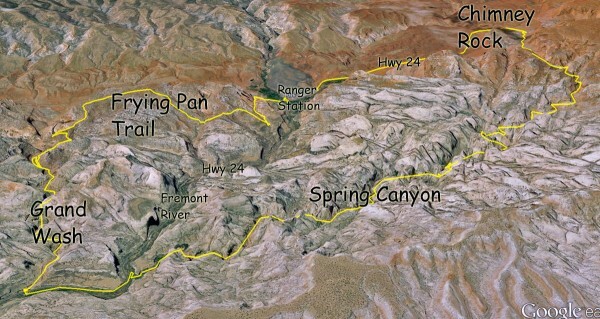 Grand Wash will lead to the Cassidy Arch Trail, the Fryingpan Trail, Cohab Canyon, and ultimately Fruita and the start. Have a beer. Cassidy Arch can be seen in the distance. This trail merged with the Fryingpan Trail, which was the highlight of the loop. 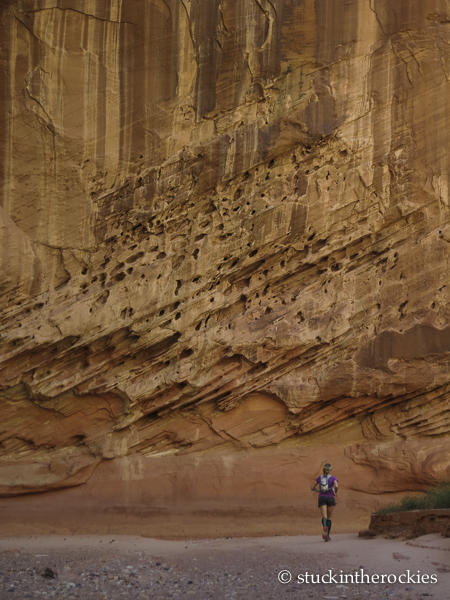 Some of the Navajo Domes above the Cohab Canyon Trail. Stay tuned for the next leg of the trip, where we embarked on a backpack through the Waterpocket Fold and Muley Twist Canyon. 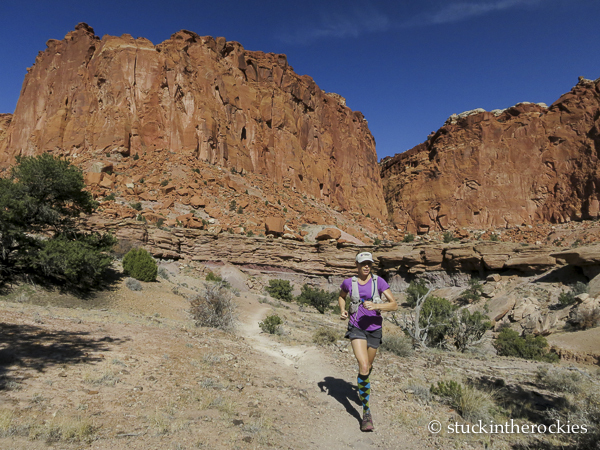 A cool 12 mile run near Moab, up Pritchett Canyon and down the Hunter's Rim trail above Hunter's Canyon. Hope you had a great trip on the Grand. I know Tim had a blast. Very cool. Love that whole area but I too have only driven through CRNP with stops at roadside petroglyphs. I hadn’t thought there were too many good running trails but you show differently. I’ll have to go check it out! I think we did a good job of getting the most out of the Fruita area with that run. I don’t think we needed much more time there. But the lesser known options down south in the Fold could take a while to fully explore.